After the clock stuck twelve last night I slipped out of the warm house that was filled with a group of humans I’ve grown to like a lot. I slipped out barefooted in my sparkly gold dress with a glass of champagne and I sat on the edge of the porch with my feet up listening to the ruckus around me on the university street I live on and I watched the snow fall silently to the ground. That’s the only way I can describe what occurred. Weeping. I wept for things lost and moments gone. I wept for joy that was taken. I wept for my aching heart. I also wept for the beauty. Beauty of marriages and babies and friendships formed. I wept for the love I feel and the love I’ve been given. And then two of the most important women in my life this year, Patty & Joanna, popped out to hug me. And we had a moment reminiscing on where we’ve been, what we’ve done and how we got here. Then we went inside to finish celebrating and laughing and starting 2017 off with a bang. And then, today, the wind came. It met us after church. It was howling and sweeping around not yet melted snow. And it kept coming. As I’ve sat in my front room attempting to rest and gear up for another week, the wind has knocked on my door on multiple occasions, it’s rustling the barren trees and moving around the bits of trash left over from a night of people reveling. The wind met me, a little over 3 years ago, on a dirt road in Swaziland. Out of absolute stillness the wind came. In that moment it came to knock down walls in my life. The wind met me again in Spain. It was destructive, and calming and aggressive. It uprooted and plowed through me. Today, the wind met me in 2017 to uncover. I had a dream two nights ago, which is rare for me, and as I talked it through with a friend I realized it was full of significance for myself. In part of the dream we were restoring this beautiful estate. We were moving mounds of dirt that had piled up over these beautiful porches and patios and gathering areas. And then we gathered and celebrated in the beauty we had uncovered. I’ve always known that the wind comes to uncover what was already there. What’s been there. You just have to choose to clean up the mess that it moved. Who knows what 2017 holds. I may or may not find that guy, I may have more unsuccessful days at work, the two year olds might do me in, I might feel lonely or sad. But the wind came today. The wind came and it moved all the crap and dirt and pain that 2016 left in its wake. It moved all of it to show the beauty that 2016 left. The beauty and the loveliness that has always been there. I’m going to let the wind keep uncovering the beauty and truth in my life in 2017. I am going to create more, I’m going to hone my baking skills, I am going to write. I am going to sing. The wind brought me hope today, that I forgot I was capable of having. Last night as I walked back and forth around my little town the wind was blowing something fierce. I had to put on a sweatshirt to walk to a friends and I was in love with the cold,almost violent wind that was making a noise down the sweet cobblestone streets of Mijas. The wind never stopped last night. It got louder and more consuming. Slamming doors, throwing things off clotheslines, shifting our curtains with every inhale of air. And I couldn’t find peace amidst it. Normally the wind brings me home, hope, calm. Even in it’s most rowdy, I revel in its presence. Last night it scared me. It brought me unrest, I couldn’t sleep. I just wanted it to stop, I wanted there to be a moment that I could take a deep breath before it started again. I wanted to yell at the wind. I wanted to open my mouth and shout. I didn’t like what it was riling up. I didn’t feel the peace it normally brings. I know that wind stirs and settles and calms. It mixes things up to make them look new. It brushes away debris that doesn’t need to be there. It cleans and makes a mess all at the same time. The wind wasn’t cleaning last night. It wasn’t allowing anything to exist inside of it. It was moving things to places where they didn’t necessarily belong and it was up to us to open doors and put things back together. We needed to clean up what the wind left behind. After last night I feel as if the wind left me in a mess. It was the exact picture of what I feel inside. There is this massive destructive wind going on within. Pressing against the places I’m pushing into and challenging me to stop. To be silent and to stop. But here’s the thing: the wind may be aggressive; but I can outlast it. The wind may put everything in disarray, but I know how to clean. The wind may scare me in the night but eventually it will be day. And the wind will stop. The wind will stop before I stop. So this morning when the sun finally peeked its head out over the mountains, my curtains stopped rustling. I opened doors and windows again and cleaned up what the wind brought. Last night was a reminder that something stirring up isn’t the greatest, that something being pushed around and reaching the point of feeling unsettled isn’t fun. But it also brought the picture that morning will always come. And that we can outlast the night no matter how dark it seems. Right now, the wind is doing something in me; even when it isn’t outside for me to see. It’s pushing things around and calling me to sit in the dirt and the muck and be ok. The aggressive wind showed me that I can sit in the chaos and not become chaotic. That there can be destruction around me and I will not collapse. And the wind will stop before I do. 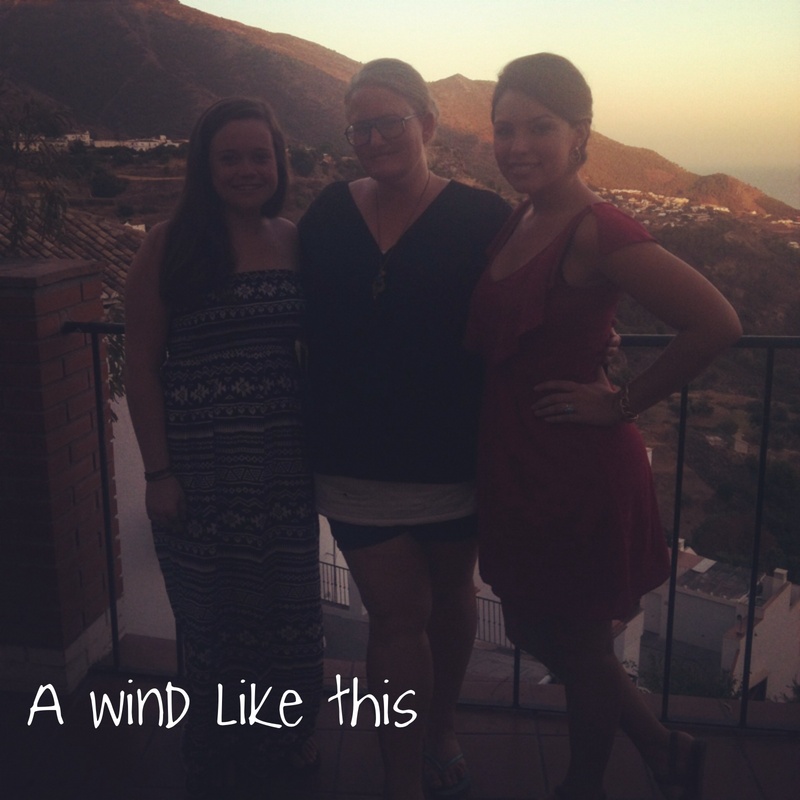 Mijas has some of the most beautiful moments of wind. At any point of the day you can hear the wind howling through the mountains and down the cliffs and rushing toward the Mediterranean Sea. 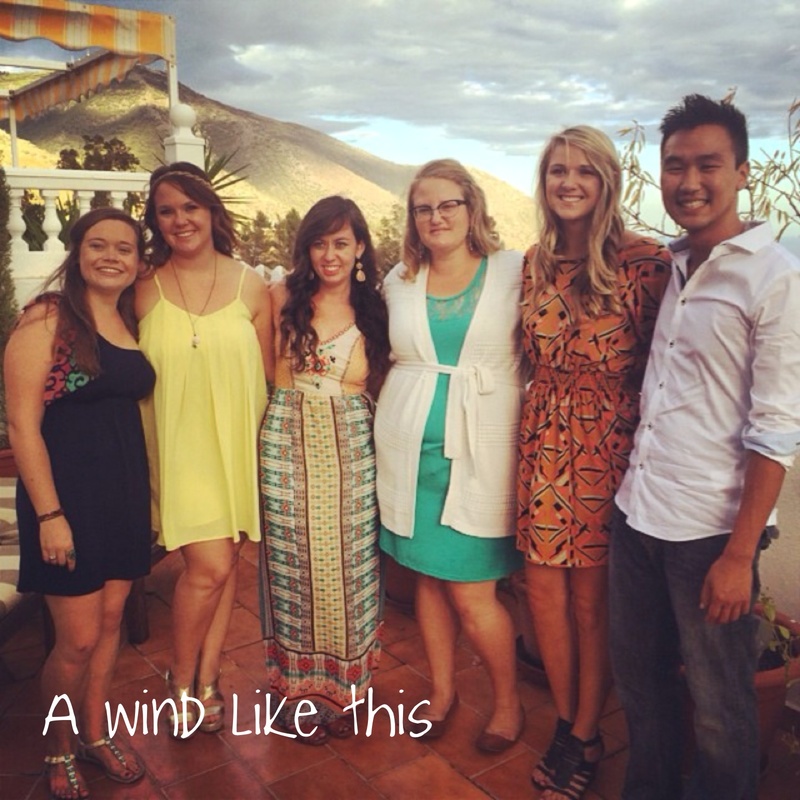 The 5 of us + our Alumni squad leader Tiff traveled the world together for 11 months last year and then got a chance for a few more months to make home together in Mijas. I love wind because what it brings. Wind has this ability to in the same moment; stir something up, change what it looks like and in the same “swoosh” settle it. Wind provides chaos and calm. Over the last few days, my twitter, facebook, my blog; all of those things have been quiet. Even my communication with my friends at home has been quiet. Patty, Katarina and I. Tribe. Heart. Family. Because I haven’t known what to say. I still am not sure if I do. The wind finally stopped stirring for a moment and settled. And left me sitting here in a big quiet house with a little bit of dirt on the floor, not entirely sure what just happened but knowing I have a bit of a breath before it starts up again. The last 3 months the wind has come full force, daily, stirring up my heart and spirit with lessons, conversations, reminders, smacks in the face (only literal smacks in the face for the men). 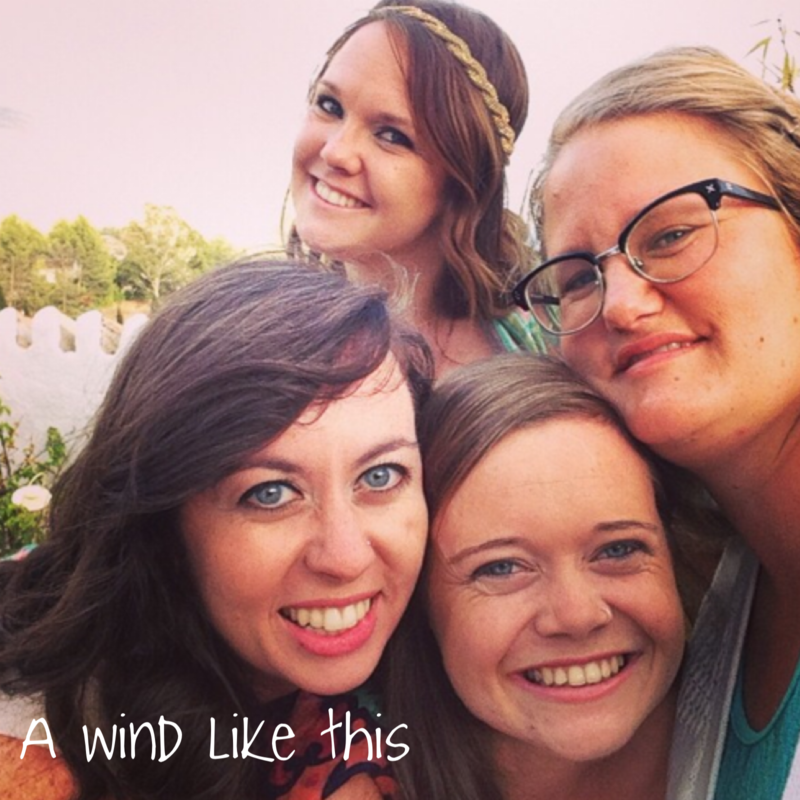 The wind has brought laughter, tears and sometimes anger. The wind brought moments abounding. We will forever & always be a #classof6. Moments that were meals eaten crammed around our table here at Mijouse, out on the patio, on the roof at Sans. Hours spent writing at Maria’s with Patty. Each moment of our precious July intern time on Mondays. Afternoons spent painting on Kaitlin’s porch or around our dinner table with Katarina, Sunday mornings spent curled up at the Suttle’s eating breakfast and watching Band of Brothers. Mornings spent walking with Tiffany or doing t25 in the epi with Abby, Jess, Traci & Whitney. Conversations with families passing through, with alumni who came home throughout the three months, sweet moments with Mama Gail and a couple Friday evenings spent babysit Ezra Lou at Suenos. Hours upon hours of corn hole after dinner every night. Family, family, family. Be still my heart. Abby, Patty & Tiff. The last week has had a few defined moments that I’ll hold in my heart: Patty and I sitting on the floor of my room as Katarina packed up to head back Monday morning: the necessity of friendship and the love of a family created. Wednesday night at graduation as NSquad took one final picture of the family of 6 that came to Mijas. Thursday afternoon as Abby, Patty and I laid and sprawled out at Tiff’s place. Napping, writing, baking, painting. And then the moment where, if but for a split second, the wind stopped. After all the graduating interns had left Emily, Patty, Zach and I were all out in the hall in Sans. It was as if we all just exhaled out and realized that we were it. The four to step into next term. 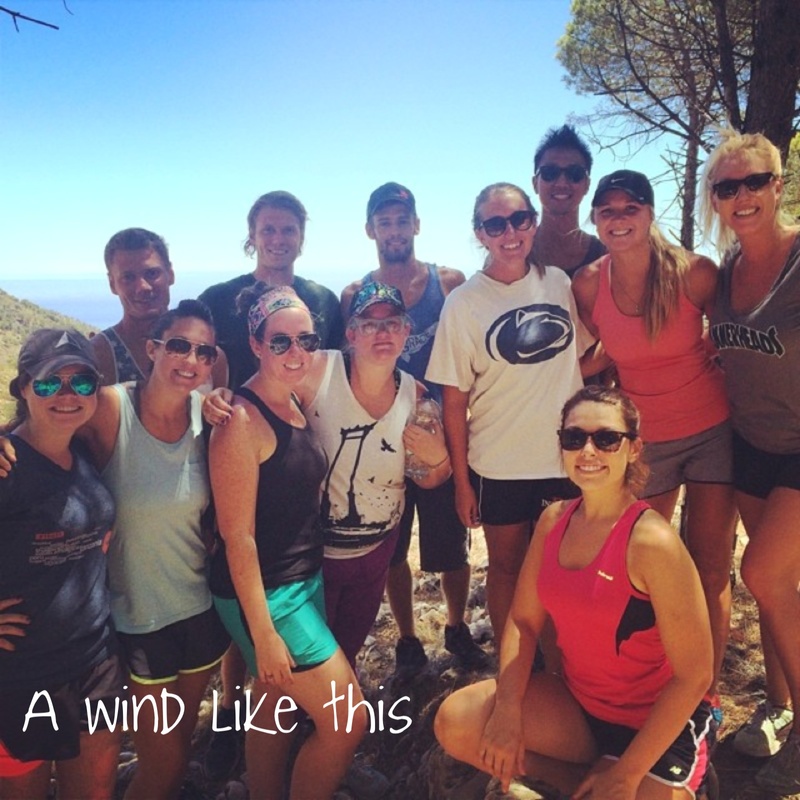 The wind settled over all of us. Each taking a different lesson, a different realization with us. I wish I could describe it more. It wasn’t a huge earth shaking. Just a picture in itself; one to be scratched out in a journal or noted in a blog. The wind is going to start up again and it’s going to be good. Two weeks of calm and quiet. And then? 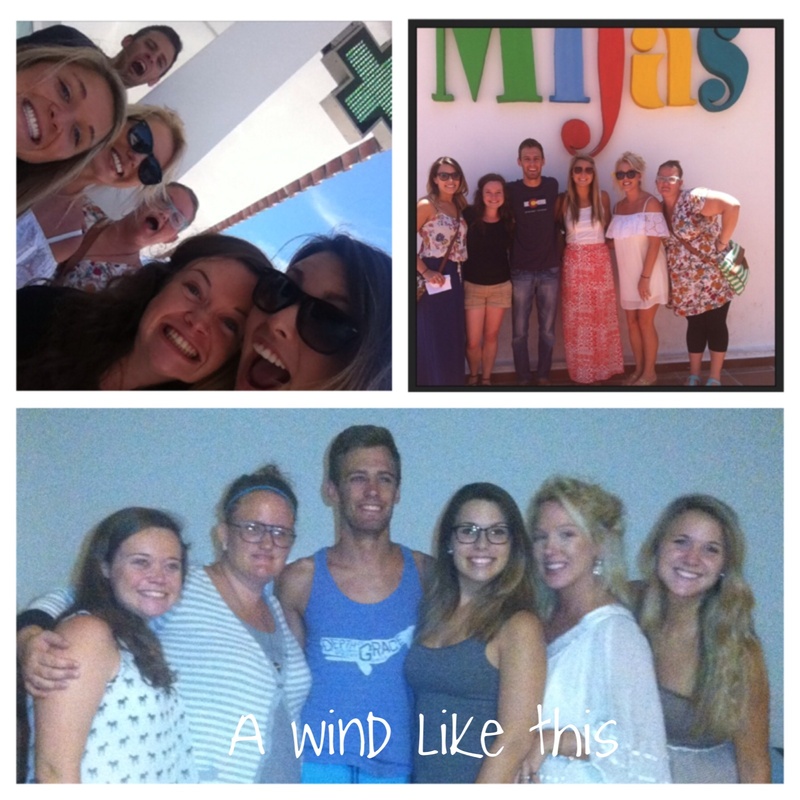 The wind swept through Mijas and through me the last 3 months. It did some beautiful, wonderful work brushing away what needs not be there in order to show what lays beneath. The wind has caused me to stand taller, and be louder. The wind has caused me to move. (( Thank you for your support and love, and prayers. Thank you to those who have believed abundantly in me. I still need help staying here in Mijas for the next three months so if you’d like to support me you can click this link and make sure to write Meg Reeve in the intern name line. And if you want to read more about my time at g42 and the lessons I’ve learned check out what I’ve written since I’ve set foot here.